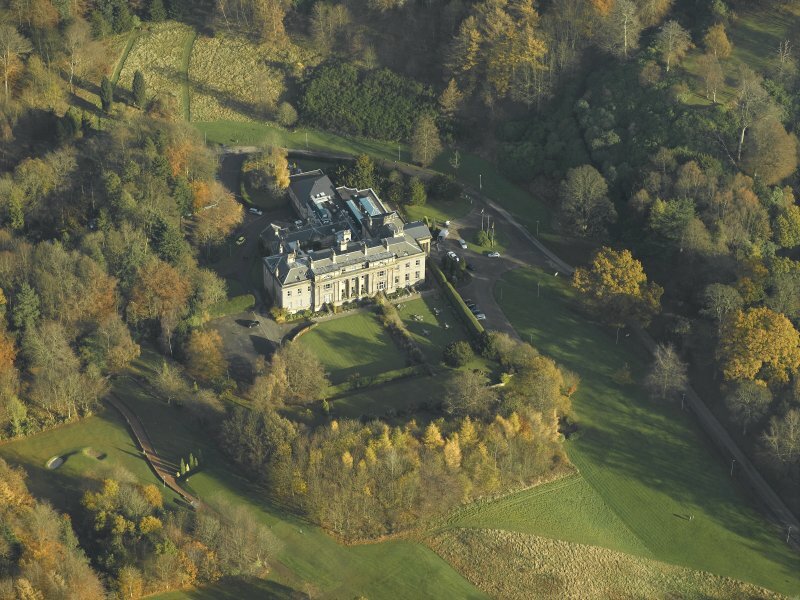 Oblique aerial view centred on the house, taken from the SSE. 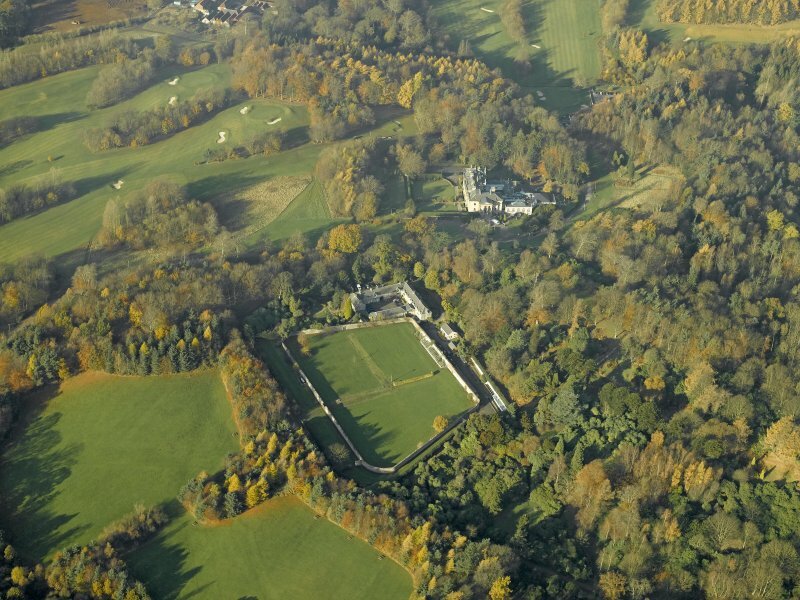 Oblique aerial view centred on the walled garden and stables with the house adjacent, taken from the SE. 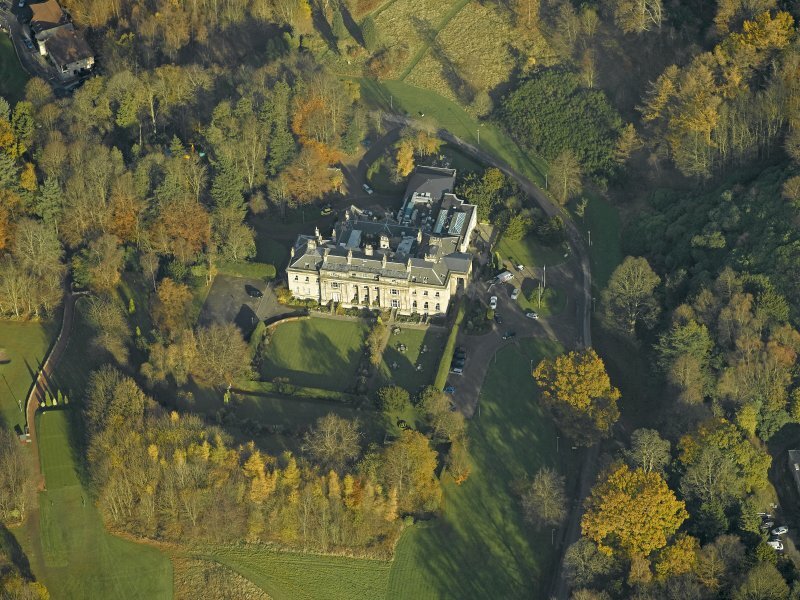 Oblique aerial view of Balbirnie House, taken from the NW. 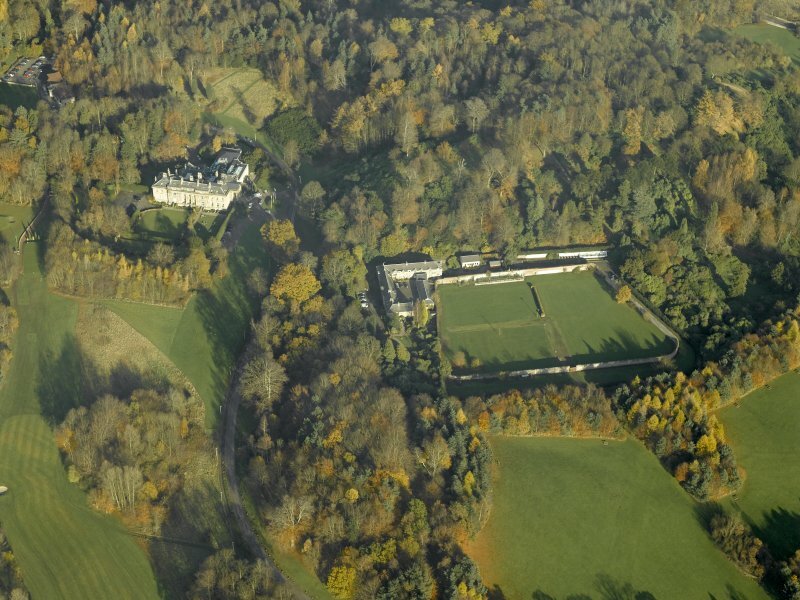 Oblique aerial view centred on the house, walled garden and stables, taken from the SSW. 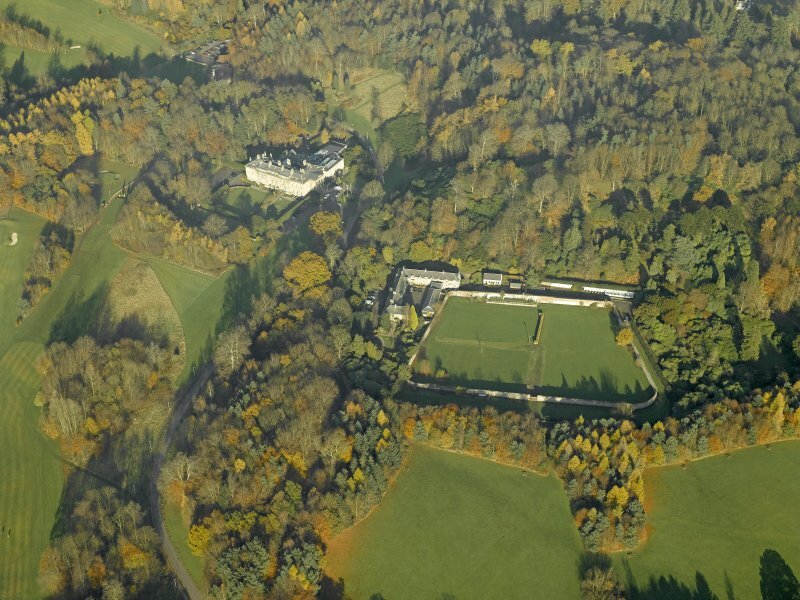 Oblique aerial view centred on the house with the walled garden and stables adjacent, taken from the W.
Oblique aerial view centred on the house with the walled garden and stables adjacent, taken from the WNW. 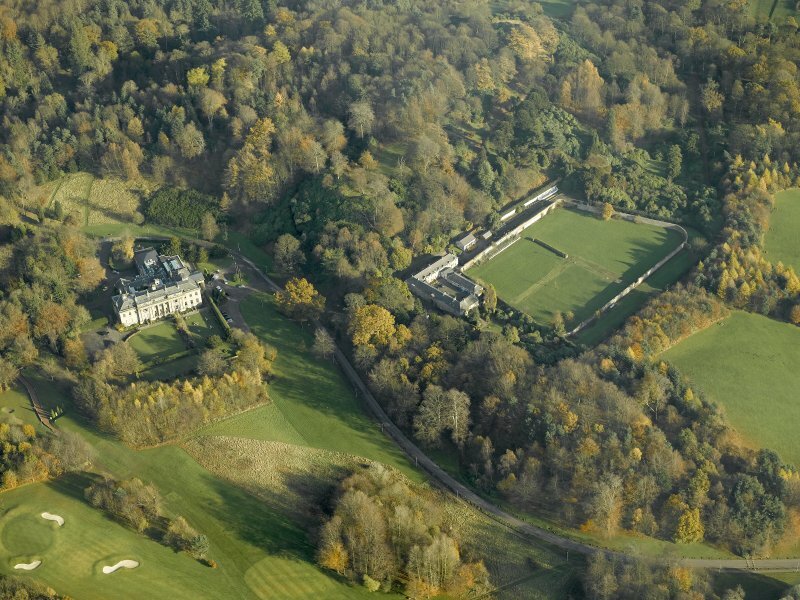 Oblique aerial view centred on the house, walled garden and stables, taken from the SE. 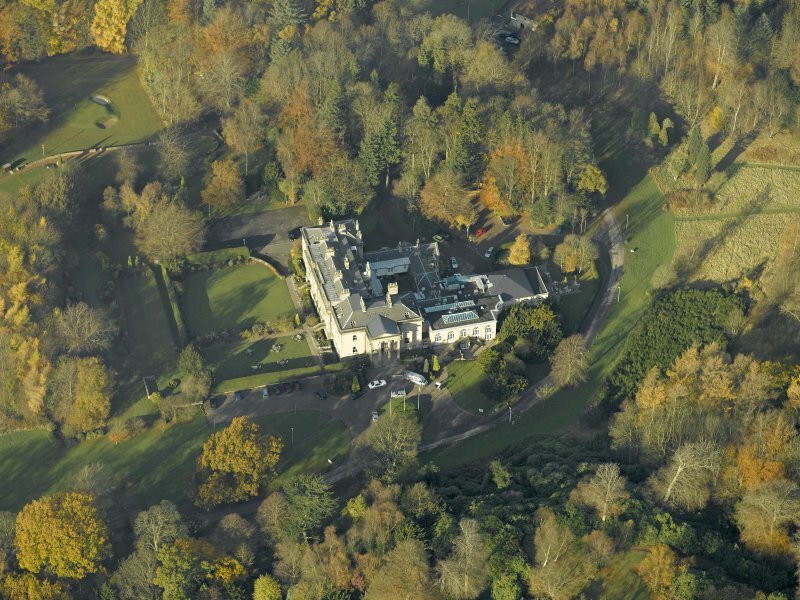 Oblique aerial view centred on the house with the walled garden and stables adjacent, taken from the NW. 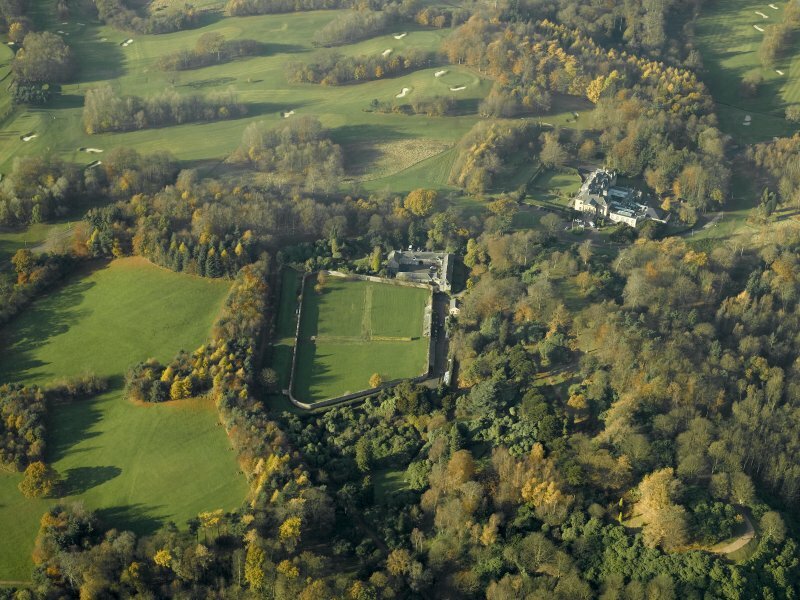 Oblique aerial view centred on the walled garden and stables with the house adjacent, taken from the ESE. 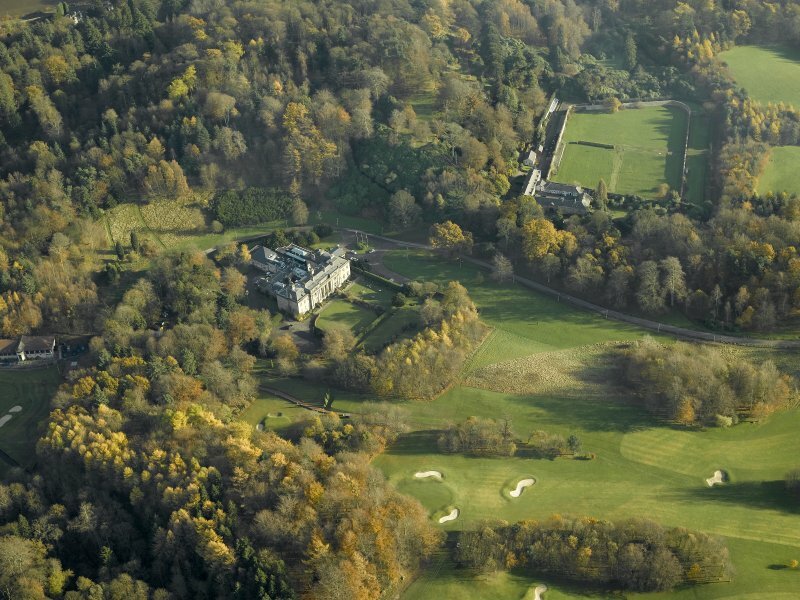 Oblique aerial view of Balbirnie House, taken from the WNW. 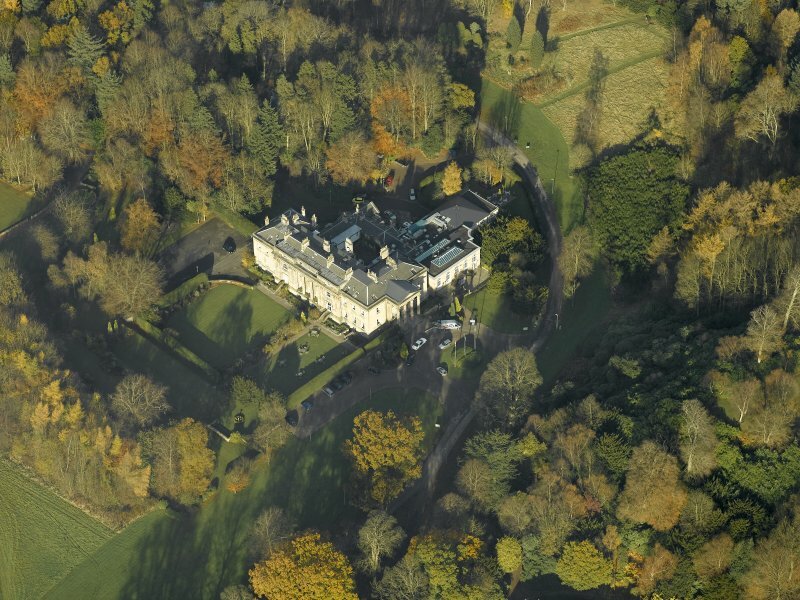 Oblique aerial view centred on the house, taken from the SSW. 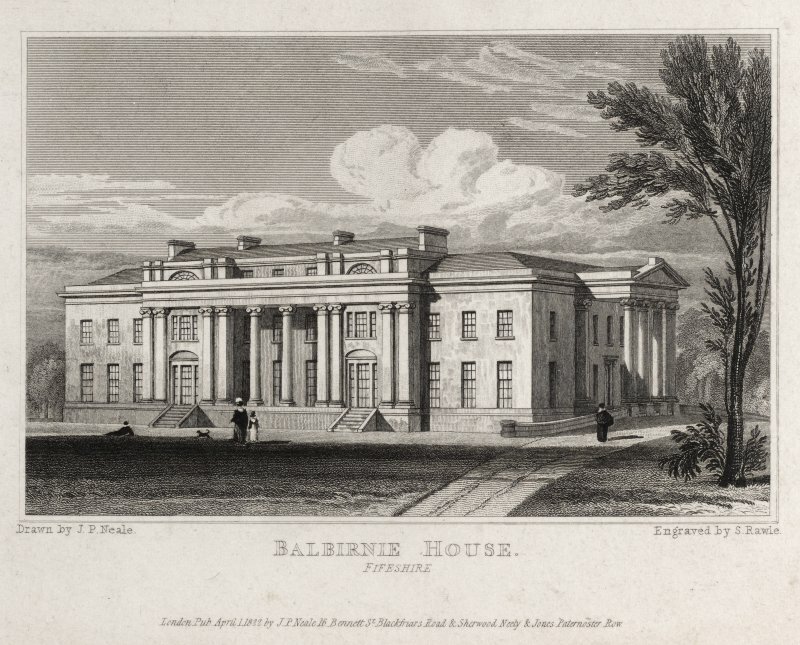 Balbirnie House - The Seat of John Balfour Esq of Balbirnie. Fife-shire. 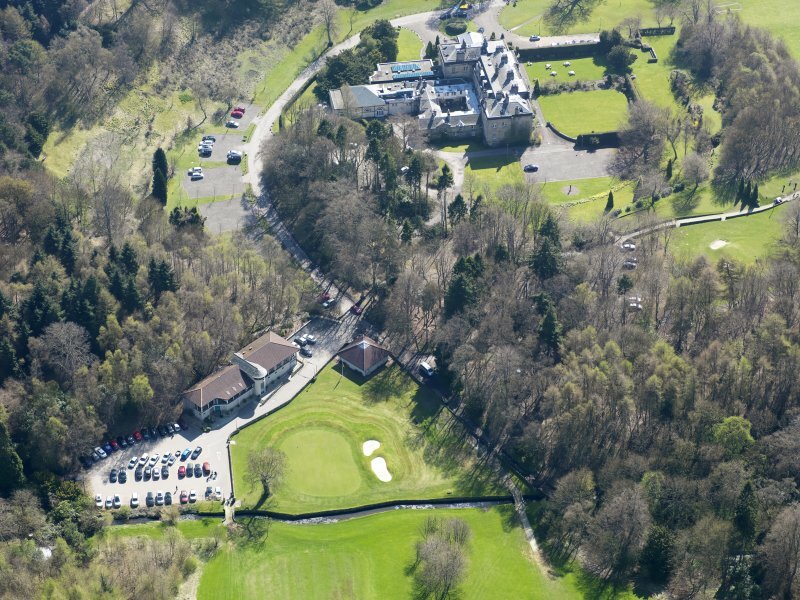 Balbirnie Caravan and Camping Club site is to be found at NO 294 019. New house & office, including repairing the Old house between 1777-1781 at a cost of ?2563.8.8d. Cash paid Mr Nisbet for part of plaster work 1779-81. 1777 accounts for quarrying stone locally. Sept. 27th 1815 - to cash paid Mr Richard Crichton, Architect, for plans per account, ?200, for a large addition to the old house. James Barclay, Clerk of Works. Mr Trotter paid for furniture Dec. 31st 1817, ?116.17.6d. Dowbiggine, upholsterer, March 3rd 1819. ?5.0.0. Anderson & Ramage, Plasterer, Edinburgh. R & R Dickson, 1824, West Lodge. ?9.18.0 for making plan. David Bryce - 1860 - Lodge. Thomas Leadbetter, 1896 - additions. James Gillespie, St Andrews 1895. Gardener's Cottage. The writer remarks on the New Front being built. 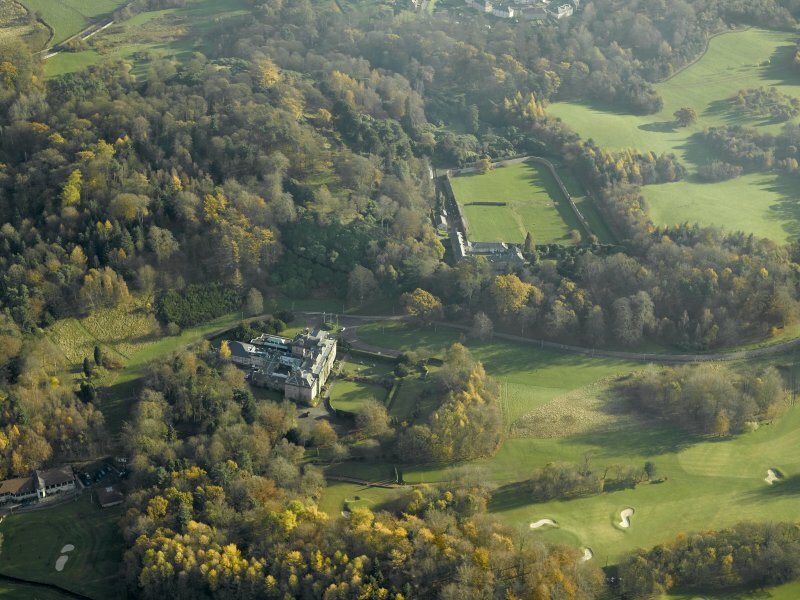 Proposed lodge to be built (at Balbirnie). 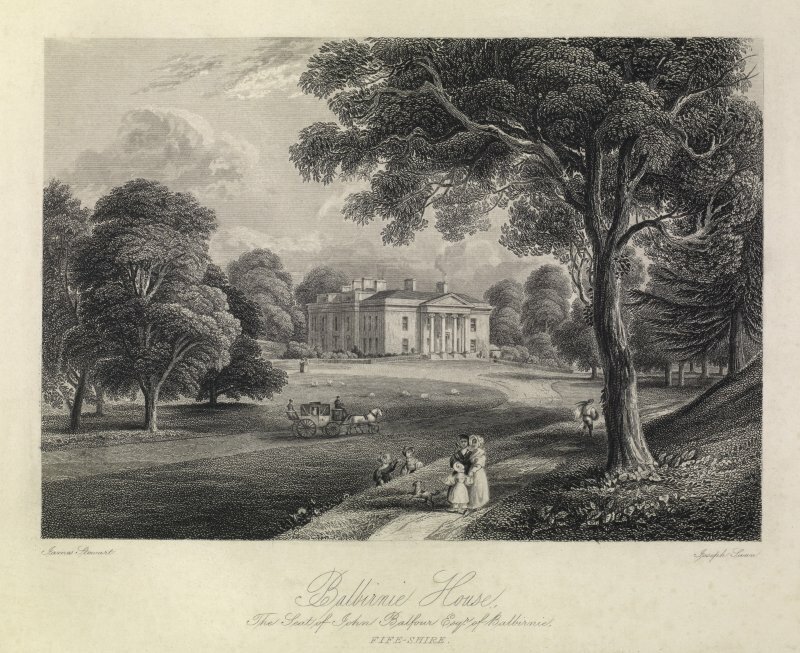 Letter from (General) Robert Balfour to John Bruce ...'the stone of my quarry is too soft a nature for pillars of a gate and some little ornamental work I require, I have to request you would allow me to get some stones for this purpose from a new quarry found on Greenhill ...about a mile NW of Nuthill House'. The sundial at Balbirnie was 'brought by the Balfours from Old Kirkforthar House together with another dial which has now (1986) been taken back to New Kirkforthar House' (MS 5741/5/14). 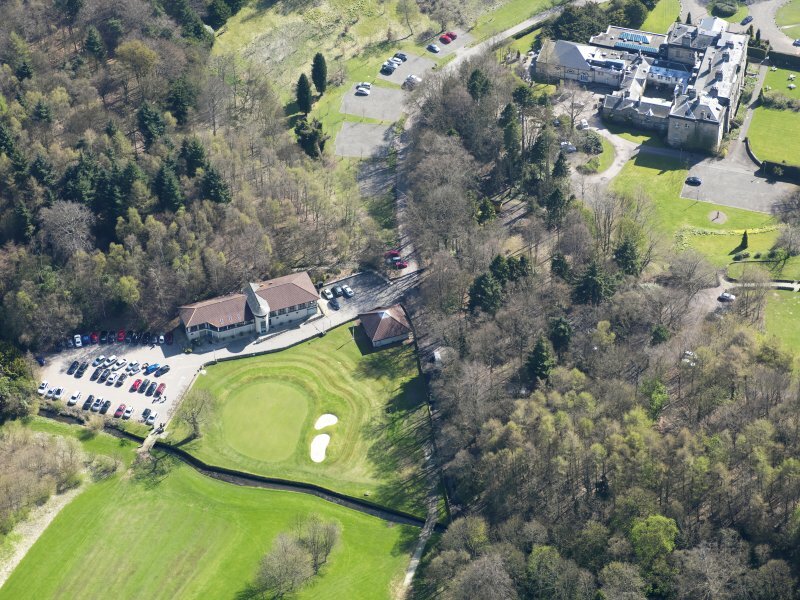 (For the sundial at New Kirkforthar House, see NO30SW 132). Information from RCAHMS (A Cassells), 17 December 2009.